Preventing flooding, greening & sustainable water supply in Spangen, Rotterdam. A climate adaptive solution for heavy rainfall, using rainwater as source for irrigation of football fields. The district Spangen in Rotterdam, encountered nuisances during heavy rainfall events. At the same time, the residents of Spangen had the ambition of improving the spatial quality of the neighbourhood with more green. An Urban Waterbuffer has been realised in the Spartaplein, where rainwater runoff from 40.000 m2 of paved surface is collected, treated and stored in the unground, preventing pluvial flooding in the surrounding and other areas of the district. The stored rainwater is used for the irrigation of the football pitch of the Sparta Stadium, creating a sustainable water supply for the soccer club. A feasibility study was first executed in close collaboration with the clients to define the technical requirements for the solution. Together with the residents of Spangen, the designers, technicians and stewards from the municipality, and the execution team, an integral design was developed. 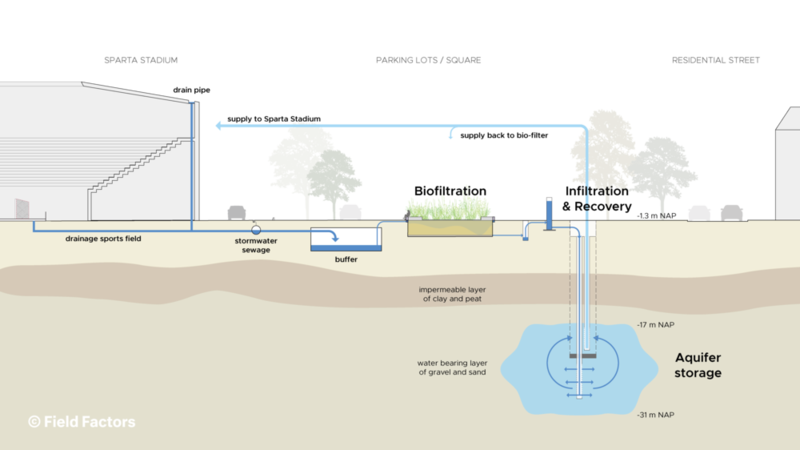 The UWB contributes to mitigate the effect of urban heat by reusing the stored rainwater to irrigate the urban green, including the biofilter. An additional water feature allows children to play in hot summer days. The reuse of rainwater for irrigation saves Sparta 15.000 m3 of drinking water per year. Through monitoring, high concentrations of iron have been found in the discharge water. The Biofilter has showed high treatment efficiency for removal of metals, preventing clogging of the infiltration well. The system will be monitored for the next 2 years. The UWB in Spangen is part of the TKI project Urban Waterbuffer, to implement underground rainwater storage and recovery in urban areas.